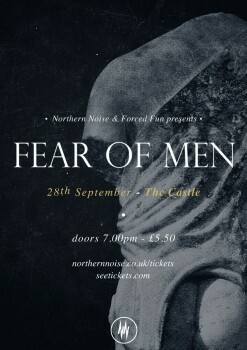 Manchester promoters Northern Noise and Forced Fun are thrilled to announce that their next show will be on September 28th with the fantastic Brighton three-piece, Fear Of Men. They’ll be playing Manchester’s Castle Hotel, an 80 capacity venue for a one-off special show to celebrate the launch of debut album Loom. The band will be no strangers to those who enjoy Manchester’s vibrant grass roots music scene. They’ve played here numerous times, one even with scene stalwarts PINS as their opening act, and most recently took to The Ruby Lounge stage with The Pains Of Being Pure At Heart. Their haunted take on indie pop is whimsical, melancholic, and somehow instantly nostalgic – frontwoman Jessica Weiss’ vocal tones evoke the memory of late ‘80s act The Sundays’ Harriet Wheeler. It’s no surprise the music press are in love with this band. Clash Magazine have made them Track of The Day three times, Line Of Best Fit gave their album a solid 9/10, and NME made them Radar Band Of The Week, plus gave both Early Fragments (demo) plus the new record dazzling reviews. Tickets are just £5 in advance. We promise you won’t be disappointed. Come and support one of the best emerging bands in one of Manchester’s most intimate venues. They won’t be playing venues this size for much longer!